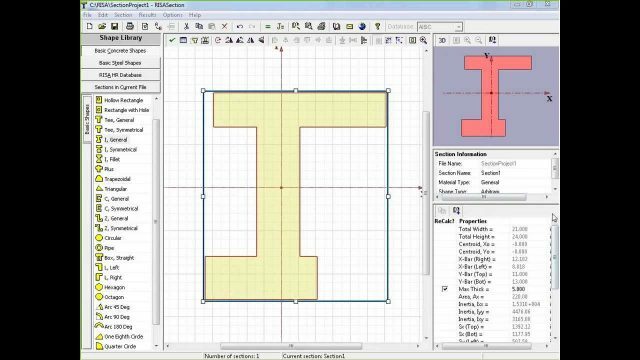 RISA Section Allows the User to define any type of Complex Cross section Either by combining standard Shapes or by Defining New Shapes. Multiple Materials are permitted in the Same section. RISA Section All calculates the section Properties, Including the torsion constant. Sections Created in RISA Section May be used in RISA-3D , RISA-2D and RISA Floor . RISA Section includes many powerful Editing Features such as automatic Stacking and aligning, Unlimited Undos , as well as the special ability to create beautiful Reports Cross section with graphics and much more. The program supports imperial and metric units. When Creating Shapes you can use the convenient “snap-to-Grid” Grid, or Specify the coordinates of each Shape Directly. Of course, Comprehensive Online help is Also included.